Geisha Wonders Video Slot Guide & Review - Casino Answers! Geisha Wonders is a 5-reel, 30-line video slot developed by Net Entertainment, featuring a wild symbol, scatter wins, multipliers, a free spins feature and two progressive jackpots. You can play the Geisha Wonders video slot at Bovada. Coin values on the Geisha Wonders slot machine are $0.01, $0.02, $0.05, $0.10 and $0.20. 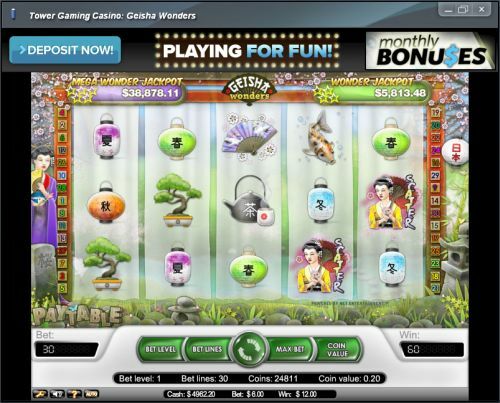 You can select from 1-30 paylines on the Geisha Wonders slot game. You can bet 1-4 coins per line (or “Bet Levels”). The lowest total bet you can make on the Geisha Wonders video slot is a penny per spin up to the maximum total bet of $24. The betting range is best suited for casual players. You can manually skill stop the reels on the Geisha Wonders online slot by pressing the Spin button in the middle of any spin. To play Geisha Wonders, select your bet and press the Spin button. You can also press “Max Bet” to play all 30 lines at the highest Bet Level. Geisha Wonders is linked to two progressive jackpots – the Wonder Jackpot and the Mega Wonder Jackpot. At present time, the Wonder Jackpot is at $5,813, while the Mega Wonder Jackpot is at $38,878. To win the Wonder Jackpot, four Star symbols must appear over top of the other symbols on the reels. To win the Mega Wonder Jackpot, five Star symbols must appear on the reels. The higher your bet is, the greater the chances are of Star symbols appearing on the reels in Geisha Wonders. You can win both of these progressive jackpots by playing at Bovada! The highest paying symbol on the Geisha Wonders video slot is the Buddha symbol. If you land 5 Buddha symbols on a selected payline, you will win the 10,000 coin top jackpot. Please note that in the paytable, the amount is listed as “1000” erroneously. The Geisha symbol is wild and will substitute for all symbols except for the jackpot and scatter symbols. The Geisha symbol is the scatter symbol. 2, 3,4 or 5 Geisha symbols anywhere on the reels will pay out 2X, 4X, 50X or 400X your total bet. 3, 4 or 5 Scattered Geisha symbols will pay out 10, 20 or 30 free spins with a 2X multiplier. Additional free spins and jackpot wins are not doubled. Geisha Wonders has an autoplay mode that can be opened up by hitting the “Auto” button. You can play 10, 25, 50, 75, 100, 250, 500, 750 or 1000 autoplay spins at a time. In the advanced settings, you can set Geisha Wonders autoplay mode to stop on any win, if free spins is triggered, if the jackpot is won, if a single win exceeds (any amount you input) and if cash increases/decreases by (any amount you input). You can stop the autoplay mode at anytime on the Geisha Wonders online slot. 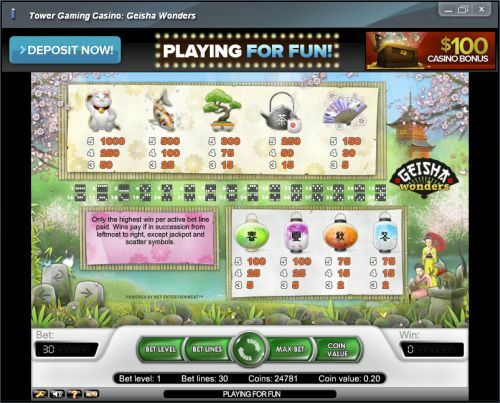 Geisha Wonders has two progressive jackpots, a great top payout and a free spins feature as well. It is a very good video slot that is definitely recommended, especially if you are interested in the Japanese theme. To play the Geisha Wonders video slot, you can sign up and make a deposit at Bovada! Can USA players play the Geisha Wonders slot game for real money? No, American players cannot play the Geisha Wonders video slot for real money. For a great selection of USA-friendly slots you can play, please visit Bovada. Where can I play a free Flash game of the Geisha Wonders video slot? You can play the Geisha Wonders video slot for free or real money in your browser at Bovada. If you have problems with the flash casino, make sure you have the newest version of Adobe Flash Player.